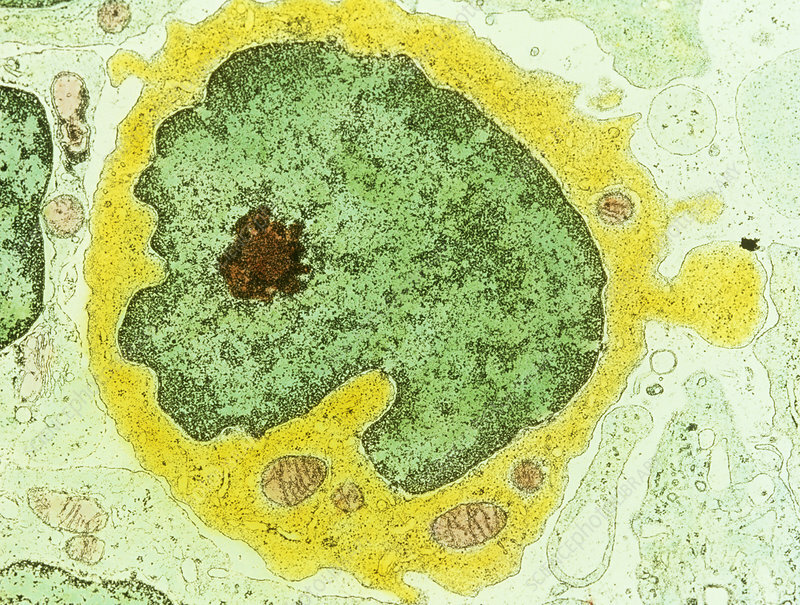 False-colour transmission electron micrograph (TEM) of a single human lymphocyte, the smallest cell in the series of white blood cells. The central nucleus (light/dark green) is slightly indented & the chromatin (genetic material - DNA) is moderately condensed; the darker coloured chromatin is seen towards the nuclear wall. The cytoplasm (yellow) is sparse, but contains a few mitochondria (small brown, cigar-shaped bodies - the site of energy production & storage within the cell). The outer plasma membrane supports a few microvilli (projections). Lymphocytes undergo transformations when activated in their role in immunological defence. Mag. X 3000 at 35mm size.